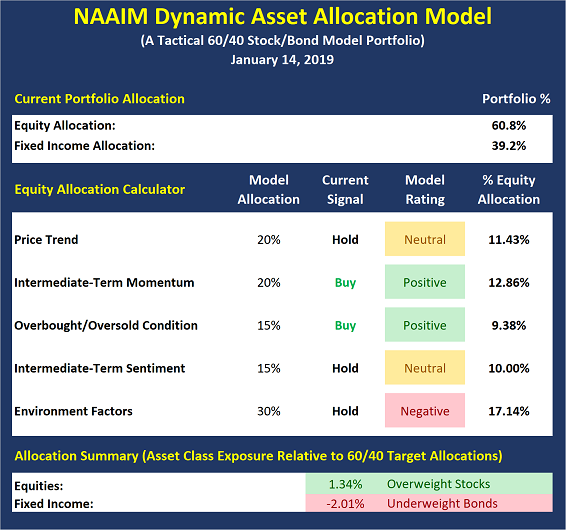 NAAIM Speaks 1.23.19: All Clear? To be sure, the recent rally has been impressive. In the last 17 trading sessions, the venerable S&P 500 has gained an eye-popping +13.6%. In the last 17 days, the index has finished in the red just 4 times and save the second trading day of 2019, the damage done during those losing sessions has been minimal. In the last 17 days, the major indices have “exited corrections,” recouped their respective 50-day moving averages, and produced what are commonly referred to as “thrust” buy-signals. And in the last 17 days, the mood has turned from dismal to delight. Suddenly, stocks don’t go down anymore – ever. The trend is up. Momentum is strong. And anyone looking to add to their long exposure has been frustrated by the fact that there just aren’t any “dips” to buy these days. 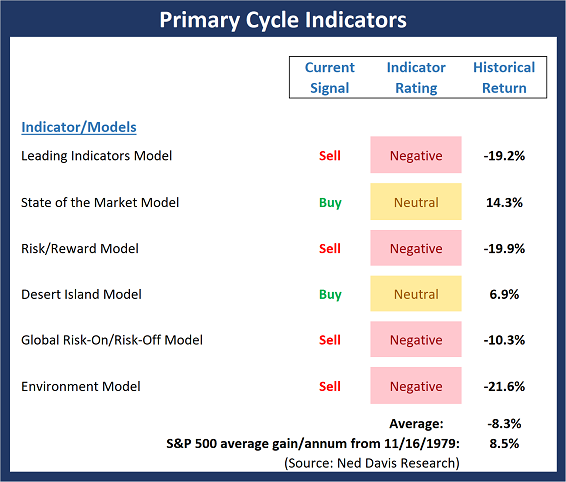 This week, we’re featuring the Primary Cycle Indicator Board, which is a group of longer-term models designed to determine the overall “state of the market” and to identify which team has control of the game. Once again, there is an important change on the Primary Cycle board this. Unfortunately, this week’s change is to the downside. While stocks are enjoying a robust rally, the Risk/Reward model slipped back into negative territory and flashed a sell signal. 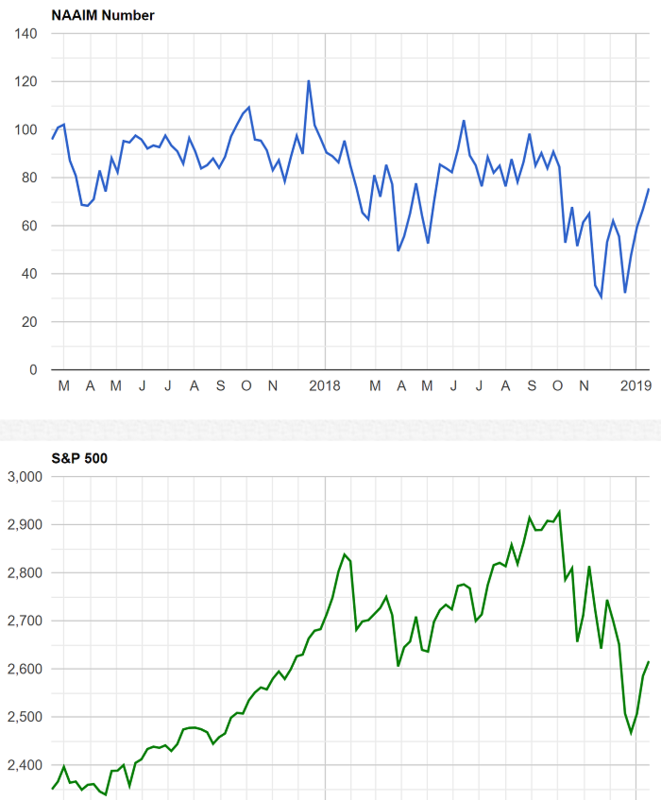 And although the rally is young, we would feel a lot more comfortable if a couple more of our favorite “state of the market” models would move to the buy side and if some of the modeal readings would turn green. “V” Bottom? Maybe. But A Pullback Is Due! Stocks closed at their highest levels since December 6th on Friday, wiping out 100% of the vicious and relentless selling wave I wrote about for so long. So far, the bottom has had the shape of a “V” which is not only rare, but generally uncomfortable for me as “V” bottoms are more characteristic of bear market than bulls. To counter that, there have been numerous confirmations that the rally since the Christmas low is a blast off of a new bull market leg. While I am much more inclined to side with the latter, I am also not dumb enough nor arrogant enough to believe I know better than the market. As I always do, we will take it day by day and week by week and see what the market tells us. Stocks have come very far, very fast as I keep hearing from the pundits in the media. Well folks, that depends on your time frame. While the stock market closed at its highest level since December 6 and has recovered 100% of the vicious and relentless selling wave from last month, it’s right back at the price levels where we saw lows in October, November and early December. In other words, stocks went straight down and straight up. I also think they are due for a pause or pullback right here and now…. t is a light economic calendar in a holiday-shortened week. Political headlines and the government shutdown will dominate financial news. Earnings reports are more important for investors, so we should focus there. I also recommend several key themes. We should all be watching closely as… The Real-Time Economic Lesson Continues. John Butters (FactSet) reports on the earnings season so far, with 11% of the S&P 500 reporting. The earnings “beat rate” is 76% and the revenue beat rate is 56%. The growth rate is currently 10.6%. On the negative side is the movement in 2019 forecasts. Estimates for the first half of the year have declined 4.5%, more than the recent average decline of 2.4%. Here is a chart showing the movement in both estimates and price over the last few months. Which is Better: Buy-and-Hope or Active Management? There are two schools of thought about investing – buy-and-hold investing and active management. Those in each camp believe strongly in their position. Let’s take a closer look. Buy-and-hold investing is a passive” investment style in which an investor buys equities and holds them for a long period of time, regardless of fluctuations in the market. It allows an investor (or investment manager) to strategically allocate assets in alignment with the investor’s investment goals and risk tolerance. On October 3rd, 2018, (I went to CASH) the Fed indicated that they were “a long way” from getting rates to neutral (indicating more rate increases on the way) and the S&P 500 Index dropped over 19% until bottoming on December 24th. Since Christmas Eve, the S&P 500 has formed a V-Bottom pattern and is up over 13% (only about 8% from the high) after the Fed indicated they may slow their rate increases. Judging from this V-Bottom, I would not be surprised to find out later that the Fed has halted its Quantitative Tightening (QT) and re-implemented some form of Quantitative Easing (QE) to appease Trump and the markets. V-bottoms were trademark (signature) patterns witnessed during the QE era, but we are now in QT mode, right? I believe that the market was expecting the Fed to plunge us into a recession with its rapid rate increase posture and now the market expects the Fed to “stand down” to not hinder the market’s advance. China just posted its slowest economic numbers since 1990, do you think the US will grow faster or slower now that China’s economy is struggling? Maybe the Fed got the message and this time is different? Treasuries in favor of riskier assets. 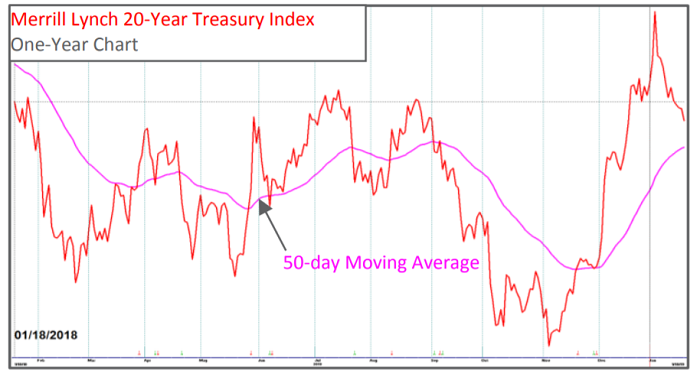 The current downtrend in US Treasuries supports the ‘risk on’ environment that we see on the charts shown. BAM Market Note: Time To Be Wary of the Move?